Murdie MacKinnon was delighted with his sides dominant but professional performance over Cumnock in a 2-0 win over the Ayrshire side at Newlandsfield on Saturday. The first chance of the game fell to Grant Evans within the first five minutes who headed over an out swinging corner from 6 yards out. 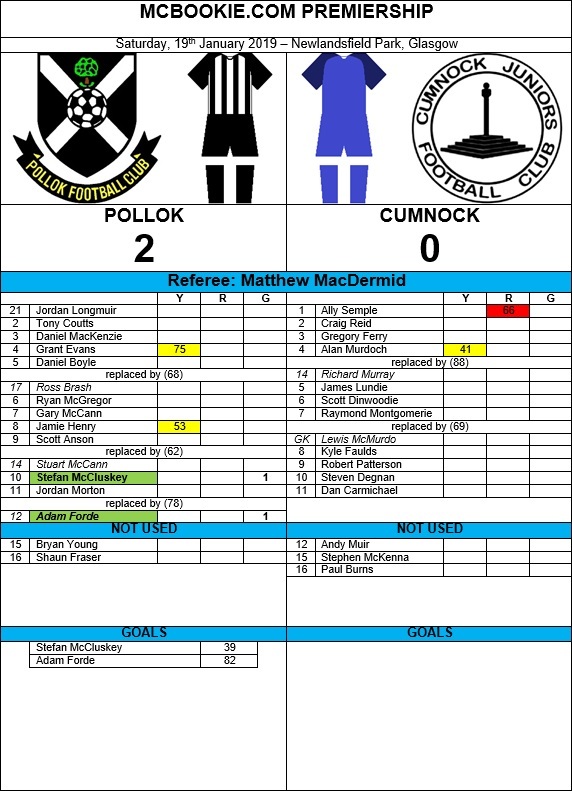 Pollok took the lead six minutes before half time. Gary McCann beat the offside trap to meet Ryan McGregors through ball on the right hand side, when up against Ally Semple he squared it to Stef McCluskey who finished into an empty net from 12 yards out. Cumnock nearly equalised just after the hour mark when Steven Degnan was found free at the back post from a corner, however he could only shoot into the side netting. With 20 minutes to go Cumnock’s day went from bad to worse. Stopper Ally Semple was sent off by whistler Matthew MacDermid after Stuart McCann was sent through bearing down on goal. After hesitating, Semple charged out only to miss the ball and take out the striker at the edge of the area, leaving the ref no option to but to give him his marching orders. With just over 10 minutes to go, skipper James Lundie’s header which was destined for the top right corner was fantastically parried away by Jordan Longmuir. With eight minutes remaining, Pollok made the game theirs when Adam Forde completed a lovely move to make it 2-0. Longmuir’s punt was only half dealt with by Gregory Ferry, his header ricocheted off Gary McCann’s back which landed at his brothers feet. He lifted it over Alan Murdoch down the right hand side for McCann to square it across goal for Forde to tap in from eight yards to wrap the game up. “I thought first half we were excellent we controlled the game well, I’d brought in some players who hadn’t featured as much to give some other players a rest and they performed fantastically. I thought Jordan Morton coming in for his debut was fantastic and he got on the front foot particularly well so I’m delighted for him. “I thought the goal we scored was a really nice footballing move. Ryan McGregor plays the ball through and Gary McCann does what he does best in beating the offside line, he’s showed his maturity and squared too Stefan who’s finished off a great move for us.